Some things never change. Xbox Live has been down for “scheduled maintenance” way beyond the original announced “schedule”. Does it even count as scheduled if your service is down for about 120% of the intended downtime? Has this become a part of Microsoft culture – not delivering a promise on time? I am usually very supportive towards Microsoft, but this is getting way above head level. I pay $35 a year to host 2 of my domains. That is about $15 less than what I pay for Xbox Live. Even then, I get a very good uptime on my hosting, and in case it’s down for an extended period of time, I get the freedom to constantly bug the person in charge to bring it back up. In the case of Xbox Live’s downtime, I have no point of contact at all, besides majornelson.com, and that too has been down for some time. 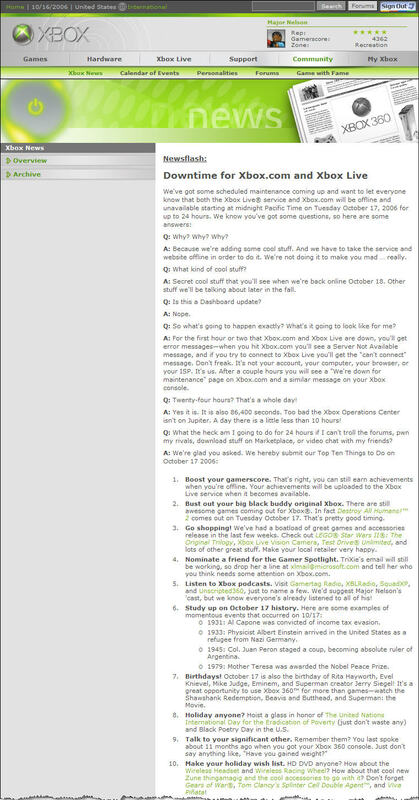 No one else knows the state of the “scheduled maintenance”, and “Major Nelson” has already suggested not to call Xbox customer service about the downtime in one of his podcasts. NEVER promise something unless you know you will deliver on it. It’s better to underpromise, than overpromise. If MS said ‘XBL will be down for approximately 24 hours. We apologise if our works continue on after this, but we will be keeping you updated’. No one would complain. If they say, as they did, XBL will be down for less than 24 hours, and it’s even 1 minute more, people start complaining. I hope Microsoft gives up its habit of never making its own deadlines. Compassion towards the customer goes a long way, especially in the face of overpriced basic services. I could seek “reparations” in the form of refunds or points, or I could just forget this whole incident, although I believe this has also happened in the past. From Microsoft’s perspective, they are working hard to manage this service, which is definitely the best online setup for any console out there. What appalls me is that they maintained so much secrecy about this whole affair, at the same time promising to make the service a whole lot better. Why the secrecy? Does it suit a big company like Microsoft to hype up its improvements even if it means coming short of expectations? We’re all paying customers, and too grown up to be excited about surprises like this. The same thing has been happening with Vista. So much was promised that there’s only scope for reduction and shortcutting. Just take note of all the cool stuff that has been pulled out of Windows Vista’s final release. And, now it’s more than a year behind schedule. Trying to justify an erratic downtime with promises of drastic secretive service improvements does not impress me one bit. That’s like Cingular cutting off my service for a day while promising to deliver a 10Mbps Internet connection the next day. Granted, I don’t pay as much for Xbox Live as I do for my Cingular service, but the point still stands. When is Microsoft going to learn? UPDATE: About 11 hours past the original 24 hour “schedule”, Xbox.com is still down, whereas Xbox Live is flaky. UPDATE: It’s now about 44 hours since the service went offline and people are still having issues. Xbox.com is still not up and running like it should, and Live is kicking off people from the servers. UPDATE: Everything seems to be back to normal now, approximately 48 hours later! I don’t see any “cool new features” besides some parental controls.